Wednesday morning was the start of the convention. We went to sleep early on Tuesday night so we could be well rested for the week, and we definitely needed that! The convention started at 10, but the line was already out the door when we got there around 8:30! 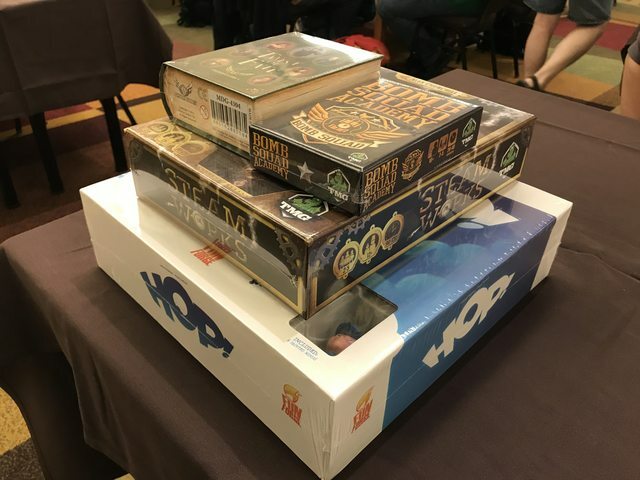 When I saw that one of the free game choices was HOP!, I was worried it would be gone by the time we registered, but we were able to get a copy! HOP! is a beautifully overproduced dexterity game, and I'd been wanting a copy since trying it at Dice Tower Con, so I was excited to get it. Since the Exhibitor Hall didn't open until Thurdsay, we got to play games from the BGG.CON Library all day Wednesday. We saw that they had the new Unlock! 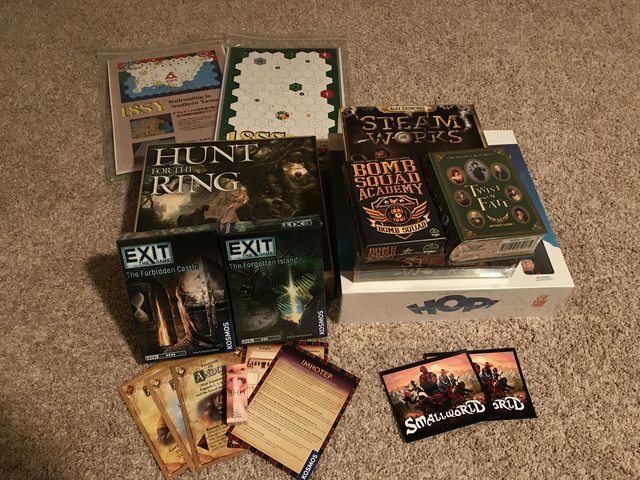 games (in the 3-box version), so we checked that out and played through all three of them! I love playing escape room games at conventions because then I won't have to buy them! 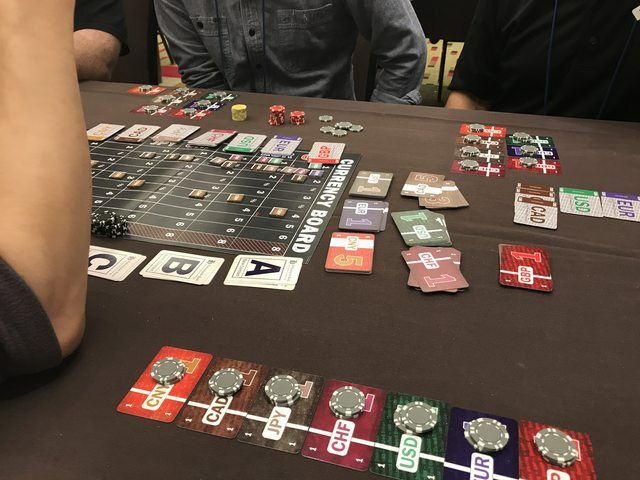 We also got to try out probably my favorite new game of the convention, Kitchen Rush. 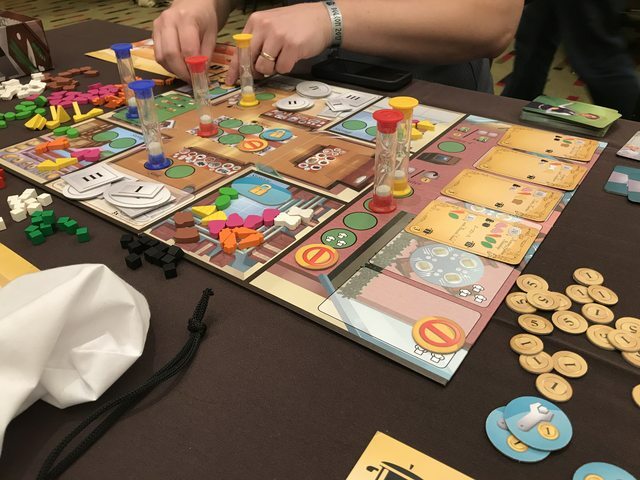 I love real time cooperative games, so I had wanted to try Kitchen Rush (and was almost tempted to back it on Kickstarter, despite my tendency not to use Kickstarter). In the game, you're working together to get ingredients and make food for customers at your restaurant. It's a worker placement game, but your workers are hourglasses that need to finish before you can move on to the next action. I thought that was pretty thematic, since it takes time to cook things. We really enjoyed our play! Thursday was our crazy day. We started the day getting to the main hall before 8, since we wanted to try some hot games (which open at 8). 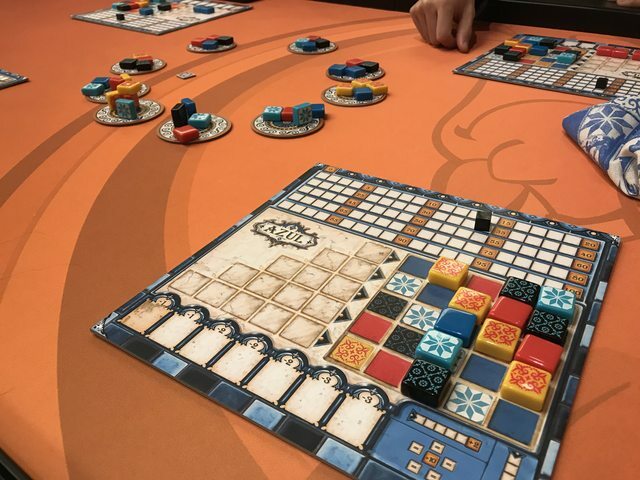 We got to play Azul, which was a really fun tile placement / pattern game. The pieces were beautiful, and it was interesting deciding which pieces to pick, since you need exact numbers in order to place them on your board (you get negative points if you have too many). You could also mess up other people by taking what they needed and forcing them to take something that gives them negative points! Since blue is my preferred player color, that automatically makes Azul a game for me! 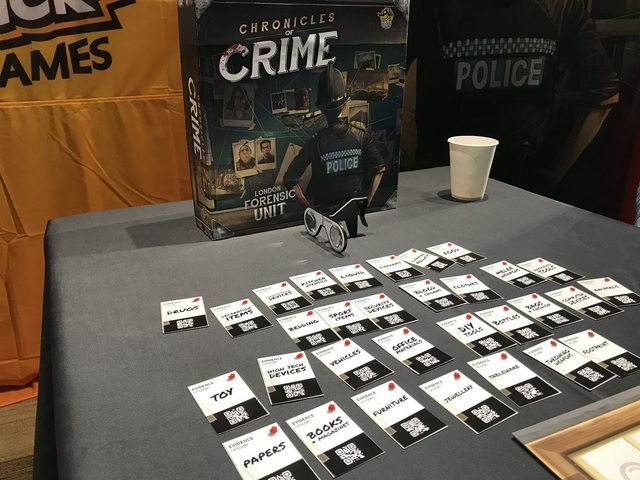 The one and only thing I had signed up for beforehand was a demo of Chronicles of Crime, an upcoming detective game that uses virtual reality on your phone. It was pretty interesting, like a mix between Sherlock Holmes: Consulting Detective and a video game, but it felt more like a video game than a board game, since most of the action was on the app. Some more standouts were playing Dragon Keepers, a new Vital Lacerda game (that he codesigned with his daughter), Gravity Warfare (a balancing dexterity game with a spinning ship), Raid on Taihoku (a cooperative game about a family surviving the Raid on Taipei), Pit Crew (a team game of speed where you're racing to be the best pit crew), and It's a Train Wreck! 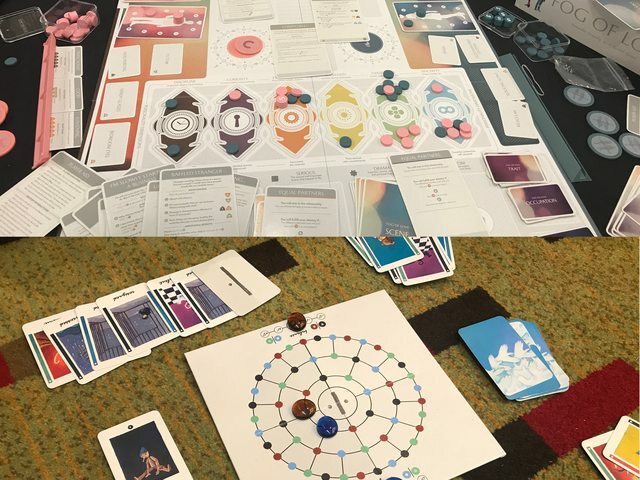 (a prototype real-time dexterity/speed game of delivering goods that we demoed last year and has changed since then). From left to right, top to bottom - Dragon Keepers, Gravity Warfare, Pit Crew, Raid on Taihoku, and It's a Train Wreck! Amazingly, we didn't only play games on Thursday. 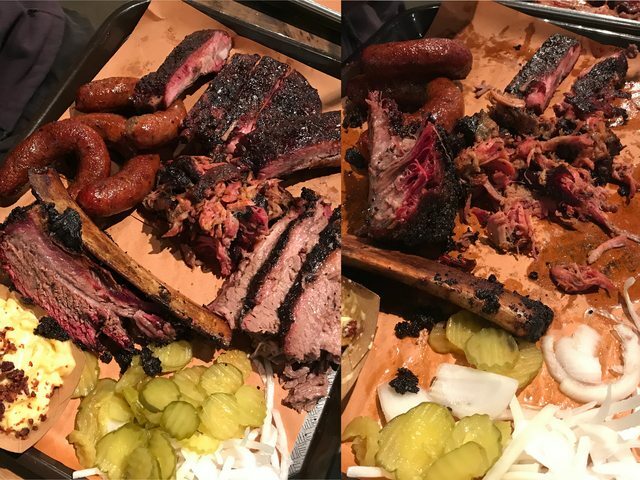 We also took a long lunch break to go to Pecan Lodge, a BBQ place about 30 minutes away from the hotel, which we'd heard was the best BBQ in Dallas. Toby loves BBQ, and we had tried to go last year, but they were closed. So we planned to go this year during lunch (since they're only open at lunch on weekdays). It was totally worth it. We got The Trough, which I think was one beef rib, a pound of pulled pork, a pound of pork ribs, a pound of brisket, and 3 sausage links. Needless to say, the two of us didn't finish it (don't worry, we brought the leftovers back and gave them to a friend), but I think we ate more than half! It was the most delicious BBQ I've ever had. The brisket was so tender and juicy, and the beef rib was amazing! After the craziness of Thursday, we slept in a little on Friday, and decided to eat some fruit for breakfast. 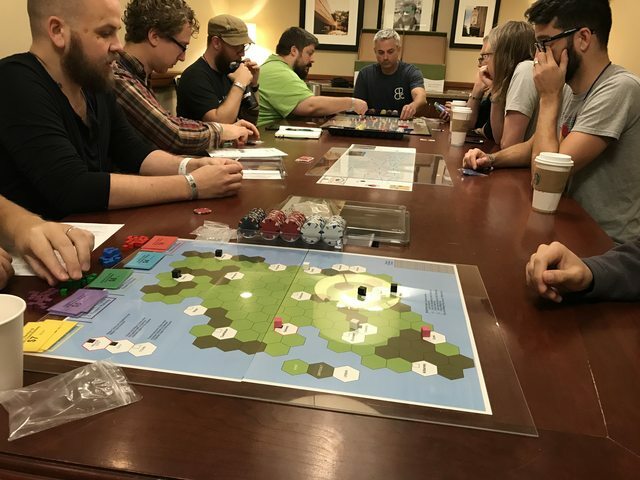 We had also heard from Travis (of Low Player Count) that there was going to be a Winsome Games day on Friday in one of the side rooms, so we checked that out. Someone had brought their whole collection of Winsome Games! 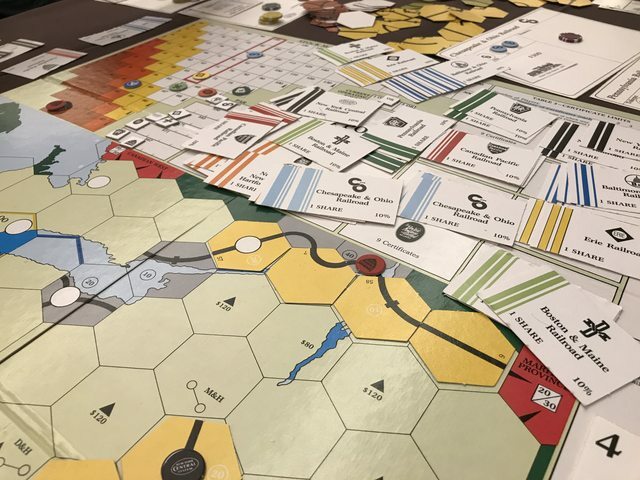 There were so many there, and we got to try Irish Gauge, which had been on our want to play list for a while. We also got to try an unpublished 2018 title that was pretty fun! There were so many Winsome Games being played! We demoed a couple more games, and played some more games from the library. I think my favorite of Friday was Modern Art, which I'd been wanting to play for a while. For some reason, Modern Art got a bunch of reprints this year from different publishers. We got to play the Oink Games version, which, in typical Oink Games fashion, comes in a small box and is really hard to fit in the box! I really enjoyed the game - it's interesting trying to decide prices for the art since you pay to the person who put the art up for auction instead of the bank, so that factors into the cost. I'm glad there were a bunch of reprints, because I want the game now! 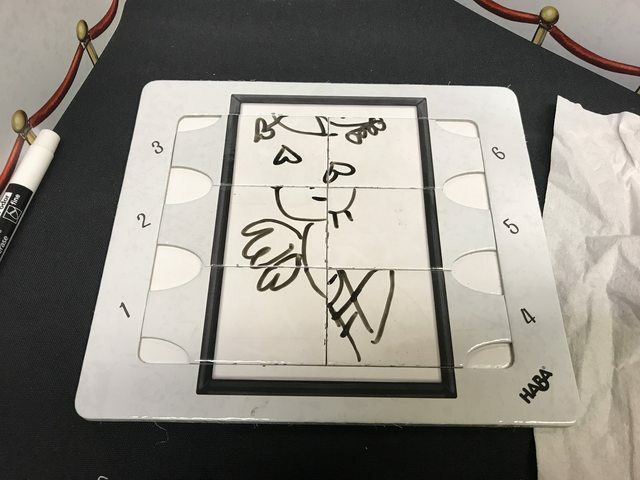 The Oink Games version of Modern Art even comes with a little easel for the paintings! Another thing we did on Friday that we don't usually do is open some of the games we bought. 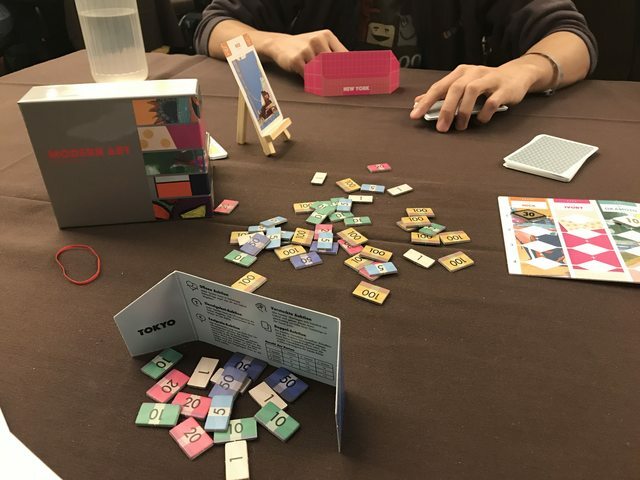 We bought all three of the new EXIT: The Game games, and we decided we could play one at the convention so we could save on luggage space (the EXIT games are one-time use and you can/need to cut and write on the pieces, so it's not replayable at all). 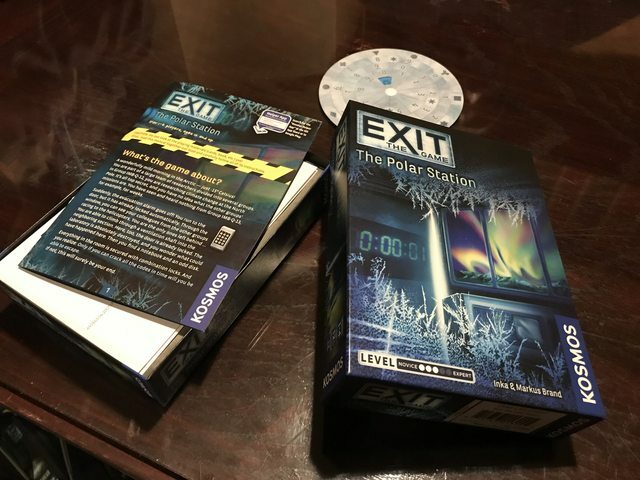 We played The Polar Station and didn't do very well (the worst we've done in an EXIT game), but we still had fun. Part of the reason we didn't do well is because we didn't have all of the extra recommended items (pen, paper, scissors), which would have been very helpful. Saturday was another day full of games and demos. 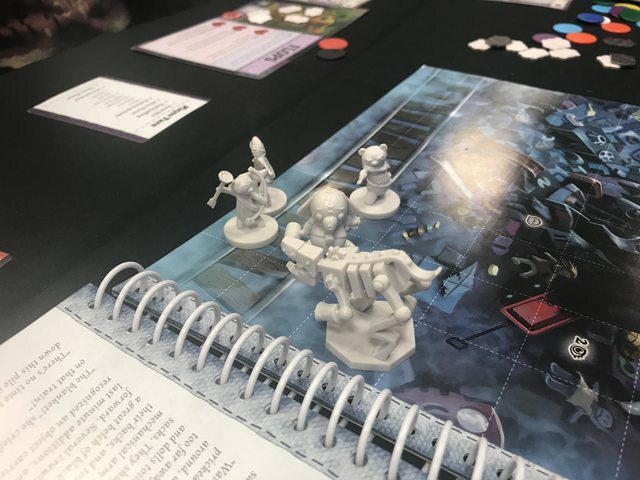 I had wanted to try out Stuffed Fables, an upcoming cooperative adventure game where you're all playing as stuffed animals trying to protect your child from the evil toys and nightmares. It was neat that the map was in a book with a bunch of pages, and depending on what happened on one page, you would end up at a different page to continue the scenario. It was pretty fun - actions are done by dice and Toby had some pretty bad dice rolls, which meant he wasn't able to keep up with us, and he even collapsed (died), but I revived him, and we managed to finish off the bad guys. Stuffed Fables is really cute! One thing that was interesting about the convention is that Toby and I played a lot more 2 player games than we usually do. Since starting up Board Game Blitz, I've been spending most weeknights doing work related to that, so we haven't had as much time to play just 2 player games. It was nice being able to play a bunch of games with just Toby! We decided to try out a couple 2 player relationship themed games that we had been hearing about - Fog of Love and ...and then, we held hands. We only played the tutorial of Fog of Love, but it was interesting and fun. It felt RPG-esque, since we were encouraged to describe our character and tell the story as we were resolving the scenes. For our goals, we needed to get our partner to resolve in certain ways, but we couldn't tell them. I started out as a criminal, and Toby was a TV star, but during the game I ended up starting a new business as a baker! We both failed our destiny, since Toby's character ended up a lot happier in the relationship than I did (I didn't get my secret trait goals fulfilled), but we had a good time. ...and then, we held hands was a very different experience - it was a puzzle and not a story game. We ended up blocking ourselves in and were unable to move, but we were close to finishing! Saturday night was the Closing Ceremony and the Game Show, so we have as much gaming time that day. During the closing ceremony, they raffled off a bunch of prizes! I think it was 60-70 packages of games, and each package had a stack of games! We didn't win anything in the raffle, but that's probably good since we wouldn't have been able to fit more games in our suitcase anyway! The Game Show was also tons of fun. There were some technical difficulties, but it was a fun night of attempting to answer trivia questions (even though I'm terrible at trivia). They weren't just questions though - it was multiple layers of trivia put together (pictures + ordering them + a clue). We did pretty badly, but it was a lot of fun. Since we hadn't really played any party games the whole convention, I wanted to play a party game. We tried to see if Two Rooms and a Boom was happening (it was happening every night of the convention), but the Game Show ended too late and it was already winding down. So then we got Picassimo from the library, and that was a lot more fun than I expected! On the cover of the box, it makes it seem like moving the parts of the picture around doesn't make it that hard to tell what it is, but it actually changes the picture a lot! And it's definitely really hard to guess when someone draws stick figures! Here's one of the pictures I drew for Picassimo - can you tell what it is? Sunday was the last day, and was really only a half day since the library closed at 1pm and we had a flight soon after. We tried a couple games in the morning, and then our last game was a rushed game of Meeple Circus, since we only had 30 minutes before the library closed when we started! 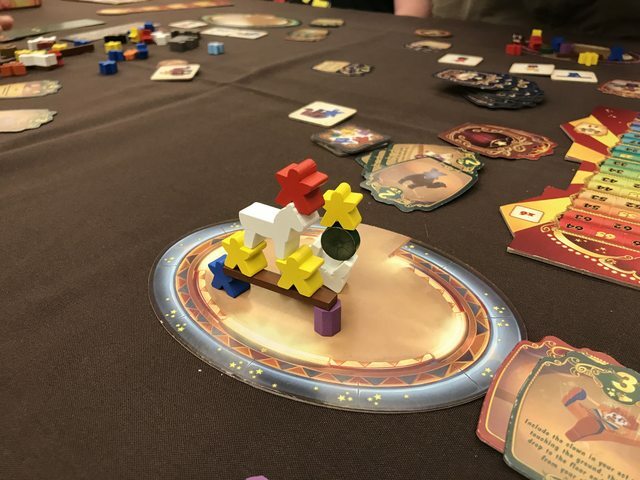 We probably got some rules wrong (and we house ruled the last round for everyone to go at the same time since we were running out of time), but it was a lot of fun trying to stack and balance our little circus meeples and animeeples to make the different poses. We were going so fast that it was hard to stack high though! 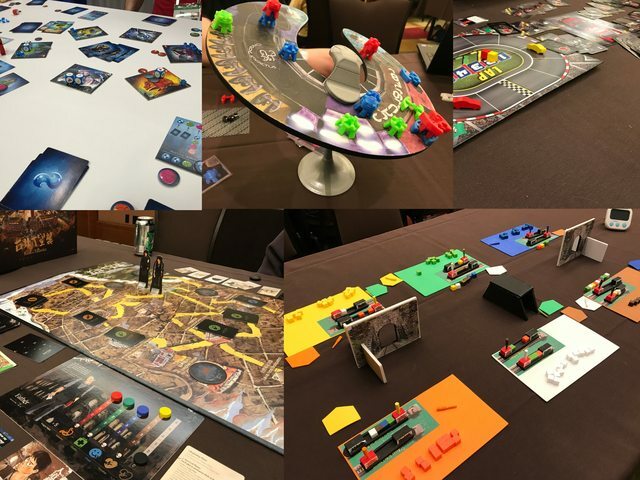 Toby and I had an amazing time at BGG.CON. Since this was our second year, we got to meet up with friends we met last year and play a lot of games with them. We also met some new people, had some really good food, and got a decent amount of games (for us) to take home! It was an exhausting trip, and we definitely won't be playing that many games again (although we say that every convention...), but we're looking forward to next year! Here's our final haul - the free games on the right and games we bought on the left!